Senior officials from China and Russia vowed on August 15 to jointly safeguard "just and equitable" international order and promote global and regional peace and stability. 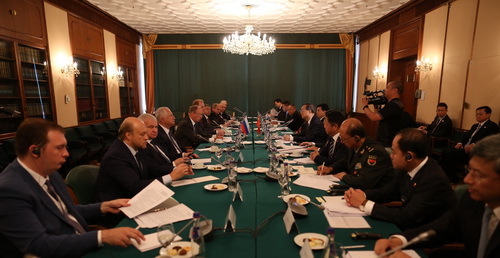 Yang Jiechi, a member of the Political Bureau of the Communist Party of China (CPC) Central Committee, and Russian Security Council Secretary Nikolai Patrushev made the remarks when co-hosting the 14th round of China-Russia strategic security consultation here. Yang, who is also director of the Office of the Foreign Affairs Commission of the CPC Central Committee, said both countries should firmly support each other on issues of major concern, increase coordination within multilateral frameworks, and jointly push for the settlement of international hot-spot issues. He said China-Russia relations are developing at a high level and have entered the best period in history under the leadership of Chinese President Xi Jinping and Russian President Vladimir Putin. Yang said Xi and Putin have already met twice this year and reached important consensuses. Both countries should work to implement those consensuses and continue to cement and enrich their comprehensive strategic partnership of coordination, the senior official said. 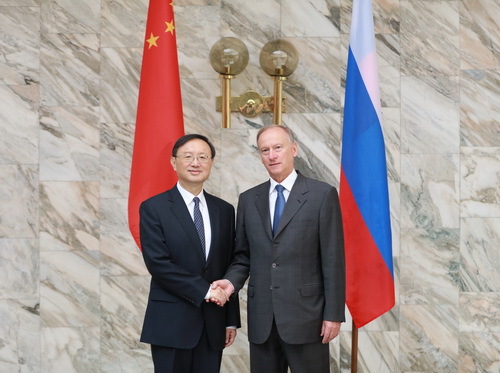 China and Russia should deepen cooperation in various areas so that it can better benefit the two peoples, Yang said. Patrushev said Russia-China ties are developing at an unprecedentedly high level thanks to the efforts of both presidents. Russia is ready to continue high-level contacts, strengthen strategic coordination, and work for greater results from practical cooperation, he said. The two sides also discussed issues concerning the Korean Peninsula, the Middle East and the Iran nuclear deal, and they reached broad consensuses.